HP LaserJet 4200 Smart Print Cartridge, 12K (Q1338A) : Disk-O-Tape, Inc. 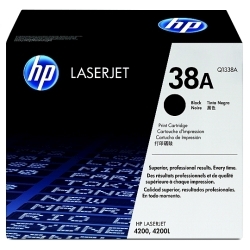 The HP 38A Black LaserJet Toner Cartridges offer great print quality, reliable performance, and easy-to-use design. 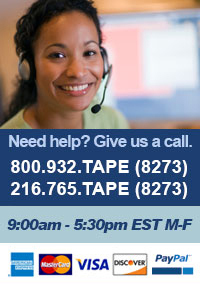 They are designed together with your HP printer for crisp, sharp results every time. Advanced toner formulation and cartridge design complement technology in the HP 38A Black LaserJet Toner Cartridge to ensure a new level of print quality consistently over the life of the supply and from cartridge to cartridge. An essential element of reliable HP printing, engineered to deliver consistently great results every time. By using these supplies, which are precisely matched to the HP printer, workgroups can count on reliable performance and precise results. HP printing supplies features make HP 38A Black LaserJet Toner Cartridges with Smart Printing technology very easy to order, install, manage and maintain. These supplies offer an added measure of control and convenience to everyone in the office. HP 38A Black LaserJet Toner Cartridges with Smart Printing technology offer higher capacity and increased yields for economical use as well as a time saving design and proven-reliable operation, all designed to reduce total cost of ownership. Page yield (black and white) Average cartridge yields 12000 standard pages. Declared yield value in accordance with ISO/IEC 19752.